Diane Reuben, Eve Firmin, Veronica Steer, Community of Advisers, YOU? Bio - In December 1985 I resigned as an employed jeweller and I started the new year in January 1986 (a few days before my 20th birthday) launching my own retail jewellery Company. Whilst developing this Firm I simultaneously continued my industry training at the prestigious College for the Distributive Trades in Leicester Square, London, and was successful in securing the R.J. Diploma which was awarded to me at Goldsmiths College by the then Home Secretary. When the recession of the late 80's early 90's hit the UK economy, I saw the writing on the wall for luxury trades and I considered that a new shift in my career path to a 'necessity' trade was then required. So I considered the question; what would be the mass market necessity that brings daily volume of sales? My answer and direction was to move in to the world of catering, so I bought an existing company and retail unit, which over the first 4 years of trading was built into a small chain of sandwich bars including a mobile delivery service. The philosophy behind buying my first sandwich shop was that everyone has to eat - not everyone needs a new diamond ring every day! Ultimately though, and at a time when our shop’s landlords started to increase rents and our customer base was shifting again, yet another new proposition was presented to me. This time, it was to enter the dynamic world of financial services. After some deliberation, the plans were set, the direction was determined and the shops and catering business were successfully sold. That was in January 1993 and since then this Company has developed and we have evolved into a multi-faceted financial services organisation. I have grown this business from a start-up 'one man band' into a successful Practice with a team of professional Insurance Advisers, Estate Planners and residential and commercial Mortgage Consultants. Without any direct marketing, we have grown as a Company with all new business received based on referrals and professional introductions. In my personal life, I continued my migration from east London, via Sawbridgeworth (great village / 15 pubs!) and Hatfield Broad Oak (a remote cottage in this Hertfordshire forest) and also via Hatfield Peverel near Chelmsford (where my children were born) until in 1999 I settled with my wife, two daughters and son in the town of Colchester. Along the way I continued my professional development training and I have successfully achieved the CeMap qualification as well as the full FPC. In addition, I am authorised and trained to advise on many areas of financial services including Corporate / Group schemes and Commercial Finance. Since 1995, I have also been taking instructions for Wills, Trusts and providing advice and guidance on Estate Administration as a legal services provider. In March 2012, I was advised by the Institute of Paralegals that "the Membership Committee unanimously elected you as a Registered Paralegal". My specialist area of legal services is advising on Wills, Trusts and providing advice and guidance to Executors and Trustees. As a long standing member of the Society of Will Writers and Estate Planning Practitioners, I continue my CPD training on a regular basis. My role as Principal of H D Consultants is to ensure that the whole Company always provides a professional, comprehensive and 'Client-focused' and progressive range of products and services. Living and working in Colchester, Essex but with most of my business carried out in Scotland! I started working as a Financial Consultant with Howard at H D Consultants in October 2004 after having worked in the IFA sector for a number of years. Predominantly, my business is BTL mortgages and I work very closely with professional landlords for their single, portfolio and BTL mortgage, finance and insurance requirements. When not working for my Clients, I'm a dad of two young daughters and also a lifelong fan of Colchester United. n this text to edit it. My name is John Constant and I have been a Financial Consultant for the past 12 years. During my time as a Mortgage and Protection adviser, I have been both employed and self-employed. My time as an employee (around 18 months) saw me working for a well-known national Estate Agency, where I specialised in mortgages and protection for those who were looking to move to a new home. Another significant area of my work during this time was the BTL market, which accounted for around 40% of written business. I am qualified to offer advice on mortgages, personal protection and Wills but I have a particular affinity for the BTL market and First Time Buyers. Both of these areas require specialised advice to be given in a clear and concise manner. I find that there is a great deal of job satisfaction, helping clients find a way forward through a situation that might seem a little bleak or confusing to them at times and I take pride in the quality of the service that I offer. My move to H D Consultants in 2012 was designed to enhance my proposition and to be able to offer a full brokerage service. I enjoy providing a comprehensive service to clients old and new. on this text to edit it. My past experience is predominantly Banking and Commerce. Having worked in the City of London for eleven years for the First National Bank of Chicago, as an Officer of the Bank, where I spent a considerable amount of time in the Dealing Room looking after the corporate clients and Traders alike. Service levels and ownership being a big priority extended to clients and colleagues in business. I am a CeMap qualified Consultant and have previously worked with the same company based in Billericay, Essex for six years. I joined HD Consultants in 2012, where we have formed a strong alliance to take our combined business forward. In addition to being a Financial Consultant I am also a Wills and Trust Adviser, and an affiliated member of the Society of Will Writers. This is an important area where clients require advice and guidance, when taking steps to ensure that their families are taken care of with the correct Estate planning. I have also had the benefit of being a shareholder and working in my own company, providing me with a valuable insight when meeting with Limited Companies, Sole Traders and business owners. Corporate financial planning requires enhanced advice skills, which I am qualified and experienced to provide. I like meeting and helping my clients achieve their objectives and goals whether it's for their finance, mortgage, protection, critical illness, secured loans and many other matters. I derive great satisfaction in always seeing the project through to its conclusion. I joined HD Consultants in July 2017 with a lot of confidence that I will now be achieving a very much wanted career as part of a professional team. I am qualified to offer advice on mortgages, protection and personal insurance and I hold the CeMAP certification. My CV includes that I have previously worked for a London estate agency and my roles have been varied, including office administrator, document controller and sales adviser. I believe that treating my clients as I would expect, and like, to be treated, is a key component in providing quality and sustainable advice. When not working my interests revolve around my family and friends, I also like going to cinema. 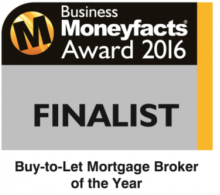 I have been involved with the mortgage industry since 2013, first as an administrator and then as an advisor. I am a CeMap Qualified advisor and have worked in various sectors of the mortgage and insurance industry, previously specialising in both New build and shared ownership schemes. For me there’s a real enjoyment to helping other people achieve that next step, whether it’s a new home, raising funds for that dream they are trying to fulfil or to help sort out a difficult financial situation. I like to problem solve which is a large part of my role, and it’s great to know how much my clients appreciate my help. I live in Essex love living close to my extended family, our door is always open for a visit and friends and family often pop in. I am married with 2 children who are fast becoming young adults. I joined the team at HD Consultants in January 2017, following a successful career spanning 30 years in a man-management role where the focus was on exceptional service delivery to enable client fulfilment. I am qualified to offer advice on Mortgages, Personal Protection and Lifetime Mortgages / Equity Release and hold CeMAP and CeRER certifications. Having been a property owner for the past 30 years and experiencing high and low interest rates, property booms and crashes, I understand the importance of receiving honest, straight-talking advice. I take pride in my work and believe that keeping my clients updated on the progress of their ‘case’ at all times is a matter of the utmost importance. Outside of work I enjoy cycling, motoring and supporting my local football team. I am a determined and driven individual with a proven track record in sales where the building of effective relationships is key to success. I get a buzz from making my clients feel very special and happy. I always push myself very hard to deliver the very best results of which I'm capable. I have a bachelor degree and I am a CeMAP qualified Consultant. I joined HD Consultants in September 2018 to offer my Clients a professional and comprehensive range of mortgage and insurance services. I love to stay active, playing tennis and swimming with my kids... I am passionate about travel and photography. Diane brings a wealth of experience to the role of Office Manager following several years of running her own businesses in the retail and service sectors. Working in a similar role in a leading dealership for one of the world’s largest prestigious motor brands, Di knows what it's like to support staff and salespeople alike. Di ensures that the smooth running of the ‘back office’ processes is professionally and compliantly fulfilled. All Advisers at H D Consultants are very aware that our Clients are our first and foremost priority. The duty of care which the Advisers impart is extremely well supported by Di and her regime of compliance, pipeline and administration management. Having previously worked in her own very successful family Firm running a national team of engineers which provided specialist support to banks around the UK, Di's experience of managing a meticulous office process assists our Advisers and Clients alike as new applications are regularly chased to successful completion and all supporting documentation is checked and signed off accordingly. ick on this text to edit it. In April 2015 I joined the team at H D Consultants as a back office support Administrator. 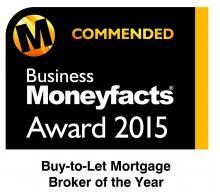 I have 14 years experience within the banking industry and many years experience as a mortgage administrator. 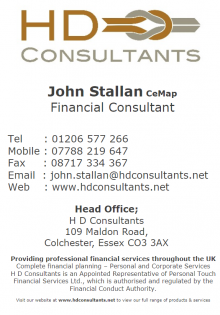 I am CeMAP qualified and am now based in our HO in Colchester supporting the H D Consultants' Brokers with our Clients' mortgage and protection applications. I am married with two young daughters and any spare time I have is usually spent on my allotment or out walking my dog. H D Consultants’ Clients all have a wide range of financial requirements including mortgage arranging, life assurance strategies, and personal and company pensions and investment planning too. Via a nationwide team of qualified, experienced and specialist Advisers, our pensions and investment proposition is available to our Clients throughout the UK. For Clients who require a local Adviser and who are not located near one of our offices, access to our full range of BTL, life cover, residential mortgage, bridging finance and personal and corporate (including auto enrolment) pensions and investment services, is available too. Our Community of Advisers is truly nationwide. H D Consultants' is not authorised to provide investment advice 'in house' , so you will be referred to a suitably qualified and authorised adviser from within our Community of Advisers with whom we closely work. Some of the services/ products shown are not or may not be regulated by the Financial Conduct Authority. AN EQUITY RELEASE PRODUCT WILL REDUCE THE VALUE OF YOUR ESTATE, WILL NOT BE SUITABLE FOR EVERYONE AND MAY AFFECT YOUR ENTITLEMENT TO STATE BENEFITS. TO UNDERSTAND THE FEATURES AND RISKS PLEASE ASK FOR A PERSONALISED ILLUSTRATION. We provide initial advice for free and without obligation. Only if the customer chooses to proceed and their case completes would a typical fee of up to 2% of the amount released be payable. For example, if the maximum threshold of 2% was charged, a fee of £1,500.00 would be payable based on a gross mortgage advance of £75,000. Our typical fee is £500.00. To contact an Adviser, or to book a local appointment with a member of our Community of Advisers, please complete the form below and send us your details and message. Would you like to consider a career with H D Consultants? Click here for an insight into our Company and details of current opportunities.